… on the way to becoming more productive. AKA excuse #0573 for not writing. The way my new office is laid out, the desk throws a shadow on itself. I have a desk lamp, and of course my spiffy new lap top has a back lit keyboard, but there’s just something about that layout that bugs me. 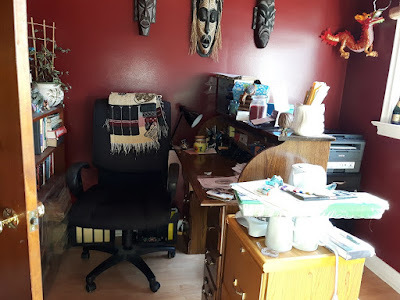 I keep wanting to turn and face west, which puts the desk on my left. So I spent most of Saturday rearranging my furniture. It’s not as though I could go anywhere, after all. We were in the midst of a raging ice storm. It started out as rain, moved on to ice pellets, then by noon it was freezing rain. In the morning the water on the tarp covering the pool was clear, but as the day continued I watched the steady progression of the ice until it was fully covered. It was kind of neat, although I’m sure I wouldn’t have thought so if I’d had to leave the house for anything. Laugh if you want, but I think there’s something to be said for the idea of feng shui. I didn’t consult a book or Google it or anything, but I can’t help feel that if I get my office set up in just the right way, I’m going to start being more productive. Maybe I’m crazy, but there you go. And that is how I ended up spending most of my Saturday cleaning the stuff off my desk and cursing and swearing as I moved stuff around. I stopped when it started to get dark because I wasn’t sure how long the power would last and I didn’t want to be in the middle of something if the lights went out. Although I enjoy the romance of candle light, it’s not exactly the safest thing around stacks of papers and books. I loved that show as a kid, and in fact I have the complete series on DVD. I enjoyed the movie with Matt LeBlanc in it too. Normally I don’t like when they make a lot of changes to old favourites – don’t get me started on the changes made to Battlestar Galactica – but I have to say, I love how they’ve updated Lost In Space. I don’t even mind that they turned Dr. Smith into a woman. None of the changes I made to the arrangement of my desk felt right so in the end I moved everything back the way it was. Of course I’m not ready to give up quite yet, I had another couple of ideas on Sunday, but it was so late in the day by that time that I didn’t have a chance to test them.